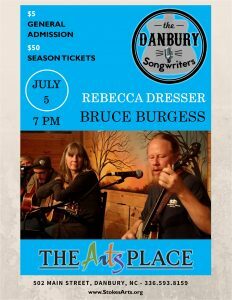 The Danbury Songwriters series welcomes Rebecca Dresser and Bruce Burgess to the stage at The Arts Place of Stokes on July 5, 2018. Rebecca writes and sings songs that she can deliver with honesty, soul, and passion. Her songs are sometimes from personal experience, but they always stem from her knowledge of humanity. Rebecca is influenced by many Texas singer-songwriters and her songs are often poetic with a mix of country and folk. But she is also known for belting out the blues every now and then. Bruce Burgess arrived in Danbury 20 years ago as an established graphic artist and banjo-picker extraordinaire. In addition to traditional banjo styles Bruce is best known for his jazz, blues, & rock improvisation and pushing the limits of what people imagine from a banjo. Tickets are $5 for the performance, which begins at 7pm. Tickets available at the door, ONLINE, or by calling 336-593-8159.